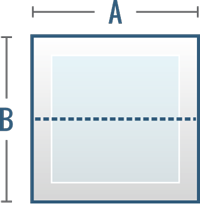 You have selected your spa shape as Square or Rectangle with Square Corners. Now please input your measurements, choose your color and cover model to begin customizing your spa cover. Spa Brand, Model & Year: OPTIONAL: Enter as much as you know. The dotted line represents the center hinge where the cover folds. Please double-check your measurements in relation to the fold orientation. Dimension B will be split in half by the fold. Please call us at (800)823-3618 if you have any questions. Please enter size in inches & round up to the half inch increment. for more easy to follow directions. Our base cover models are primarily based upon the thickness and density of the cover's EPS foam insulation core. The Thermal Guardian BASIC spa cover is an economy grade product targeted for use on spas that are indoors. If you require a spa cover that can be used OUTDOORS, is a SAFETY COVER, and available in other colors and skirt lengths, please select another model. The Thermal Guardian STANDARD spa cover is an affordable solution that is good for moderate climates. Versus the Basic, It features thicker foam, longer warranty and thicker vapor barrier. The Thermal Guardian ULTRA spa cover model is a great spa cover for people that are looking for great energy-efficiency, but want to keep the weight of the product down. These cores are MUCH STRONGER and ABSORB MUCH LESS WATER! The Thermal Guardian DELUXE spa cover is BY FAR our most popular model. It's strength and energy-efficiency at its price-point make the DELUXE the best option for most spa owners. The Thermal Guardian SUPREME spa cover is our thickest, densest cover. It's super strong and features the highest R-value of any cover we offer. Select ONE of the following colors from the drop-down box. Click on each swatch to view a larger sample. NOTE: Due to rendering variations among computer monitors, it is impossible to guarantee an exact color match. Basic covers are only available in Bourbon Brown. Select ONE of the following skirt lengths from the drop-down box. NOTE: Basic covers are only available with a 2 inch skirt. Select ONE of the following skirt lengths from the drop-down box. You have your choice of approximate locations when selecting four tie-down straps. At least 4 straps must be selected for the cover to be a safety cover under ASTM 1346-91. Straps are 9" long from bottom of foam panel. Other lengths require the selection of adjustable straps. Basic covers are only available with 2 straps and are not safety covers. Enhance your cover's energy-efficiency and longevity with this great additions. Upgrades may be added individually or in a combo. The continous hinge seal allows your spa cover to be more energy efficient by sealing the entire hinge instead of just the 4" in on each side. Great for cold climates and homeowners looking to spend less on their power bill. NOTE: You will NOT lose steam from your spa with the standard steam-stoppers. Double the protection of your cover's foam cores by having them wrapped twice! That's 12 mil of protection to keep your foam cores nice and dry and not absorbing water. Enjoy the added convenience of rubber-grip handles when opening and closing your new hot tub cover. Please note that all covers have handles and this is merely an upgraded design. Our newest upgrade! By adding a sheet of EPS foam that is laminated on both sides with reflective foil to the main foam core we are creating a system that will reflect the energy rising off of your spa back down and the cold creeping in from above back up. This breakthrough technology is added inside the vapor barrier to protect from the delamination issues that arise from the use of reflective laminate fabric found in inferior spa covers with a similar feature. Save over 26% on your upgrades when you select one of our Spa Cover Upgrade Bundles. Depending on the time of year, our manufacturing lead-time fluctuates. Custom-Made Spa Covers are currently taking 6-8 weeks for production. Our RUSH PRODUCTION option allows your order to go to the front of the line and ship in 3 business days or less! With this upgrade, we guarantee your cover will leave our manufacturing facility in 3 business days or we will refund the rush fee. Use this box to communicate any special requests for manufacturing. Some requests may require additional charges. We will contact you before placing the order into production if additional charges are to be assessed. Please take a moment to review your selections and then click ADD TO CART. You may also add this configuration to your Notebook for later purchase. Measures over 96" in the hinge length or 100" in the side split by the fold. Has cut-outs for a control panel, speakers or handles. Is not completely flat on the bottom. Has more than 2 foam panels. Is shipping to an offshore island or remote mountain location, Hawaii, Alaska or New York City. Is on a Hot Spring Spa with a cover lift which arms install/mount directly into the cover.